There was an article in the Marin IJ yesterday on the amount of water used by lawns in the summer months. This is going to become more and more of an issue as building continues in California, and water supplies are tight. Alternatives to lawns range from synthetic turf, to alternative lawns, or low water use plantings. One aspect that struck me was the amount water districts are paying local schools to replace natural turf with synthetic- $15,000 per acre. That is $.35 per square foot, which wouldn’t begin to pay for the sand underneath the new synthetic turf, let alone the cost of all the materials and installation. It is a small step in the right direction though. School fields tend to be difficult and poorly maintained. Those schools with synthetic turf such as Marin Academy, which was one of the first high schools in Marin to install synthetic turf, look pretty realistic aesthetically. There are a host of new technologies on the market which aim at water conservation. Smarter controllers are one way to improve water use. 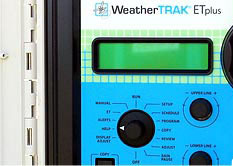 WeatherTrak Controllers, produced by Hydropoint, a local company out of Petaluma, use innovative weather tracking systems, to monitor and adjust watering. With a subscription service, data is downloaded to the controller and adjustments to the watering schedule are made automatically. These new controllers are the wave of the future, as water districts are starting to clamp down on water use and make mandatory these new technologies.